A Self drive South Africa tour itinerary incorporating South African wild life, South African Tribal Culture, and the internationally famous Sun City Hotel and entertainment complex. On arrival at Johannesburg International Airport you collect your 1400cc air-conditioned car and head east on the freeway to Mpumalanga. Overnight at a beautiful, luxurious Mediterranean retreat situated on the banks of the Elands River, halfway between Johannesburg and the Kruger Park. Relax and enjoy the beautiful gardens and surrounding scenery, or make use of the hotel’s outstanding amenities including Jacuzzi, sauna, gym, tennis court and swimming pool. Board basis is Dinner, Bed & Breakfast. Departing Machadodorp after a full breakfast continuing eastwards to the Sudwala Caves turn off. An ideal spot to have a break and visit the 2nd largest cave system in South Africa full of various shaped stalactite & stalagmite formations. Spend some time in the full size Dinosaur park, where scientists believe could have been the cradle of human life. After contemplating our ancestral roots you climb up over the scenic mountains to the little forestry capital village of Sabie for a light lunch in one of the many interesting little restaurants in the main street. Before reaching your final stop for the day, a visit to the historic gold mining village of Pilgrims Rest, now declared a national monument is an excellent idea. This village is steeped in history and is a must see. The historic story of "Jock of the Bushveld" (a dog) originates from this town. The original little Royal Hotel was a Roman Catholic church in Maputo which was disassembled and carried by ox wagon to it current location. 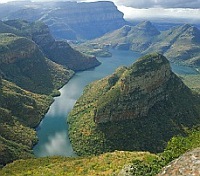 Sabie, the little timber capital of Mpumalanga, is where you will overnight. Board basis is Bed & Breakfast. The northern Drakensberg mountain range provides a majestic backdrop to the largest private game lodge in the Greater Kruger National Park region. Although large, it is stylish, roomy and beautifully positioned along a dry riverbed that guests can’t help but fall in love with. Each spacious room at your private game Lodge features a full en-suite bathroom and a terrace with uninterrupted views into the leafy-green Big 5 game reserve. The central guest entertainment areas include a large rim-flow swimming pool with sun umbrellas and recliners for lazy afternoons. The long L-shaped relaxation lounge and bar under a double-volume thatch, curves around the pool and on either side is a huge double-sided fireplace creating a wondrous open-plan yet cosy atmosphere. The Rhino Boma dining area with tables arranged under a low thatch in a horseshoe curve has a central open space where a roaring outdoor fire gives a glow to evening meals. Buffet-style meals introduce African flavours with Pan African dishes using fresh local ingredients and specialist dishes featuring venison like kudu and impala. Accompanied by highly skilled game rangers, guests set out on early morning and evening game drives, to discover the wonder of the African bush and a unique encounter with its majestic inhabitants. (Optional) On one of the days you could enjoy an elephant back safari. 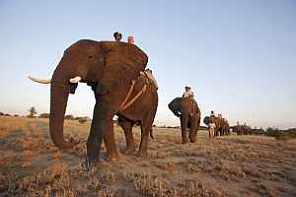 During the elephant-back safari, guests are seated on comfortable canvas-covered saddles positioned behind an experienced elephant handler. From this vantage point, they are able to view game from close proximity as the elephants move silently and in single file through the bush. The unique and memorable experience of interacting with Africa's gentle giants will be savoured long after guests alight from the patiently kneeling elephants. You will also have the opportunity to visit the Hoedspruit Endangered Species Centre. Established in 1990 as a breeding programme for cheetah, the Centre now also breeds and conserves other African species for re-introduction into the wild. On the guided tours, visitors have the opportunity to view rare and endangered species from close range - including the extremely rare King Cheetah. Three meals per day – full English breakfast, light luncheon and dinner in the open-air boma or thatched dining room. Teas, coffees, cakes, pastries and afternoon teatime snacks. Two game drives daily (including night drive by spotlight) in open safari vehicles, accompanied by experienced rangers and expert Shangaan trackers. Spoil yourself ! 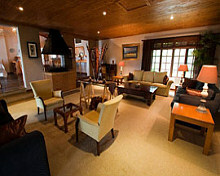 After a hearty breakfast it will be time to leave this luxurious safari lodge and drive to Hazyview where you will be accommodated at a charming private country lodge and enjoy sumptuous home-cooked meals. Balance of the day is for your relaxation either in the pool or with your feet up on a sun bed. Being in the middle of 24-hectare estate with panoramic views of forests, gorges and great ravines it is easy to forget that the world around you even exists. Board basis is Dinner, Bed & Breakfast. After breakfast it is time to set off westwards where you will be staying in a cultural village - Gauteng's most exciting showcase of African cultures. Visitors to this village are introduced to tribal arts, dancing, history, tribal legend and cuisine of five of Southern Africa’s greatest tribes. Have a traditional sangoma (witch doctor) throw the bones and read your fortune and enjoy the greatest feast and dance show in Africa. Board basis is Dinner, Bed & Breakfast and cultural experience. After enjoying a traditional breakfast it is time to say goodbye to the tribes and head off for your final stop - Sun City a little bit of Las Vegas in Africa. 'The place where the excitement never sets' - Sun City has something for everyone with a wide range of hotels to suit every taste and an exceptional range of sporting and leisure facilities. 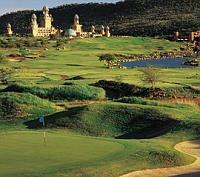 Two visually breathtaking championship golf courses, designed by Gary Player, offer a challenge to golfers of all abilities. 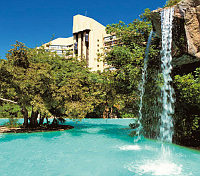 The Valley of Waves offers even more, from surfing two-metre-high waves to relaxing on the Lazy River ride. You can even spot the Big Five at the adjoining Pilanesberg National Park or be pampered with a range of health, skin and beauty treatments at the world-class spa. Enjoy magnificent gaming at the casinos, explore the nightclubs, cinemas, coffee shops, restaurants and curio stores - the possibilities are simply endless. Kamp Kwena Children's Club is a dream-come-true for children. Mum and dad can feel free to enjoy all the resort has to offer, safe in the knowledge that your children are having a great time in the supervised children's entertainment programme. 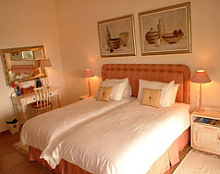 Surround yourself with quiet luxury in the rich, warm, welcoming atmosphere of this gracious hotel. A relaxing stroll through the picturesque gardens and aviary or the lush tropical forest with its cascading waterfalls and refreshing swimming pools will expose you to the timeless romance and rhythms of Africa. Board basis is Bed and Breakfast. Depending on the time of your flight, you could still enjoy some of the activities on offer. Eventually the time arrives to load up your suitcases and head back to Johannesburg International Airport (approx a 2 hour drive) and bid South Africa a fond farewell taking with you your memorable holiday captured on film. Selftours supply a comfortable 1400cc vehicle with air-conditioner, power steering and radio/CD for your 10-day 9-night tour. The package gives you unlimited free kilometres and with comprehensive supercover insurance for two drivers. 100% supercover insurance means no excess liability for you to pay in the event of an accident or theft of the car, subject to terms & conditions that will be supplied to you on collection of your rental car. Upgrades to larger vehicles are also available on request as an optional extra. What is included in the package. 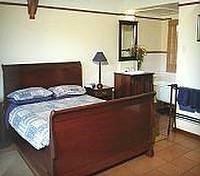 - Upmarket en suite accommodation including full English breakfast. - Dinner at Machadodorp, Private Safari Lodge, Graskop country lodge and the tribal village. - Fully inclusive wildlife experience. - Complimentary entrance to cheetah breeding centre. - Fully inclusive Tribal cultural experience. - All road maps of your tour area. 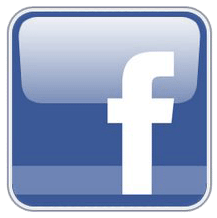 - Your car is collected from the airport and on departure returned to the airport. - International and/or domestic airline tickets.